A commentator on Japan for NPR and former Washington Post bureau chief in London and Tokyo, T.R. 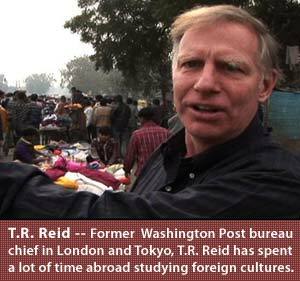 Reid has spent a lot of time abroad studying foreign cultures. But Ayurveda was still an unfamiliar option to him when he was considering shoulder replacement surgery. It fit nicely, though, with a larger book project he is working on, exploring various health care systems around the world, part of which will be featured as a FRONTLINE documentary next year. So he decided to give it a shot. Here, he talks with us about his experience of being subjected to Ayurvedic treatment and whether he emerged from it a believer. FRONTLINE/World: Before starting this story and your larger project examining health care around the world, how much did you know about Ayurvedic medicine? T.R. Reid: I knew nothing about Ayurveda when I set out to India for the cure, but I was slightly familiar with yoga, which springs from the same ancient Hindu scripture. I did a little study before we went to India, but I have to admit that a lot of that "research" was in travel brochures for Ayurvedic massage spas at five-star hotels. Q: Did you realize beforehand that you’d be stripping down and getting a series of hot oil massages on camera? A: The daily oil massages were delightful, and in some ways the best part of the whole regime was the moment each morning when my chief masseur, Vinod, would use his powerful hands to wash my whole body and remove the oils. He always poured a brown powder (some exotic herb) into my hair after the bath, and I was forbidden to shake it out. The massage where they beat my shoulder with bags of rice dipped in boiling milk was weird but not unpleasant. Q: Many of the treatments seemed rather torturous. Was it as bad as it looked? A: I was not aware that my treatment required a full-body "detoxification." They carried this out by pouring noxious oils into my eyes, nose, ears and mouth, and then each of these orifices was supposed to expel toxins. This was the worst day of the treatment by far, and I had almost no warning beforehand. Even worse, Dr. Somat, the young Ayurvedic doctor assigned to me, had a terrible bedside manner; when I was wailing about the burning acid in my eyes and ears, he stood there laughing. He found it funny. Q: What Westerners call the “placebo effect” -- and often consider the mark of an ineffective medicine -- seems an expected and essential element of Ayurveda. From your experience, how much does believing it will work account for its effectiveness? A: Ayurveda is an offshoot of the Hindu faith. Religion -- that is, the confidence that the gods are on your side -- is a key part of the treatment. At the chikitsalayam, I was required to go to the temple each day and walk three times, clockwise, around the statue of Dhanwhantari, the Hindu god of healing. And an astrologer -- they called her a "yajnopathist"-- had to read my star chart before treatment began. All this was designed to make sure that heaven and the stars were in proper alignment for me to be healed. And I can see the power of that guarantee. The placebo effect definitely works. If you believe that the gods and the universe are on your side, that's major-league placebo. The interesting thing is, I didn't believe in Yajnopathy, or Dhanwhantari -- but I still got better under the Ayurvedic treatment. Q: Your Ayurvedic therapy appeared both intensive and expensive. How prevalent is it in India, and is it widely available to all levels of society? A: Ayurveda is used daily by hundreds of millions of Indians. The treatment looks expensive; it would probably be impossible to pay for it in the United States, with six people required for one massage. But manpower is readily available in India, and thus you can get a six-person massage for the price of a lunch. Q: What effect has the influx of Western medicine had on the practice of Ayurveda? A: The big Ayurveda clinics now use x-ray machines, stethoscopes, and other western tools. But the techniques and medicine are still strongly traditional. Ayurveda exists in India as a separate path to healing. It doesn't so much compete with allopathic medicine; it tries to get to the same place on a different road. Ayurveda got a big boost from Ghandi and Nehru. They strongly promoted traditional Indian science as part of their battle against the raj. Many of the older Ayurvedic practitioners today say they were influenced by “Ghandiji” to study Ayurveda rather than get an MD. Q: While the trend of going abroad to try alternative treatments is on the increase, so is the trend of going abroad to get cheaper Western medical care. Did you encounter any of that? A: It's true that many Westerners are now going to India, Thailand and so forth for low-cost medical treatment, particularly surgery. Some Westerners also go to places like Coimbatore, where we were, for full-scale Ayurvedic treatment. Frankly, I'd recommend it -- it definitely worked for me. I think another month of Ayurvedic care would make my shoulder even better. So I'd say I was converted by this experience.